We are pleased to announce that leading buying group Vetsure has become one of our sponsors. FIVP is grateful for the support it receives from its industry partners and is keen to work with companies supporting the independent sector. 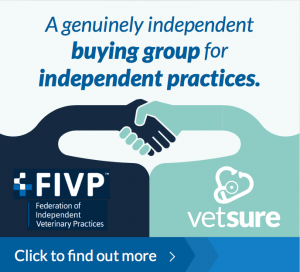 Vetsure’s commitment to the independent practice through their buying group services makes it an ideal partner for FIVP member practices. One of the largest buying groups in the UK, Vetsure represents a network of caring, passionate and like-minded members who benefit from a model that helps drive client footfall and provides savings on the cost of veterinary care. The sponsorship agreement will benefit the members of both FIVP and Vetsure who will be able to take advantage of the key offerings of both organisations.